The 2018 Baker Park Golf Course Labor Day Tournament has come to a close. This year there were 218 men who participated and 56 women. There were fewer Men that participated this year, but Saturday’s weather had a lot to do with that. We hope to see those who weren’t able to play this year because of the weather back next year again!! Thank you to all for making this a great weekend and tournament!! We hope to see you all again soon!! The Kewanee Park District is home to a Par 71, 18 hole public golf course located at Baker Park. The front 9 are all flat holes with a total yardage of 3,043 yards from the blue tees and 2,748 yards from the red tees. The back 9 offers a little more of a challenge with the hills and a total yardage of 3,127 yards from the blue tees and 2,896 yards from the red tees. Baker Park Golf course has a rating of 68.7 with a slope of 112. If you are looking to join a league, Baker Park Golf Course offers a wide variety of leagues and nights to play on. There are men’s, women’s, senior’s, junior’s and couple’s leagues avaialable to all golfers whether you are a member or non-member. Golfers can also take advantage of the driving range located just north of the golf course. Tokens for range balls can be purchased right there at the driving range or at the clubhouse. Tokens are $2.50 for 40 range balls. Baker Park Golf Course also hosts many playdays and special golf outings for businesses, clubs and organizations from all around the area. To schedule a playday or outing, please contact Brian Johnson, Director, at 309-852-2872. 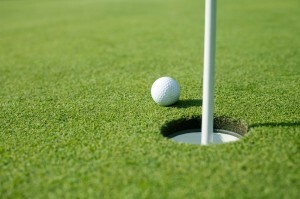 Many clubs/organizations schedule playdays as fundraisers by obtaining hole sponsors to be placed throughout the course. All proceeds from hole sponsors goes directly to the club/organization hosting the playday. You can also plan a steak fry at the 19th Hole Restaurant for after your playday. The 2013 golf season was the first to take advantage of the new irrigation system installed by the Kewanee Park District Board of Commissioners. Many patrons were pleased with the difference the new system made. The lack of rain this golf season really allowed the benefits of the irrigation system to come through. The ability to keep the golf course green allowed golfers from all over the state to bring their families down for the day to play a round of golf and enjoy the atmosphere and hospitality of Kewanee. Kewanee Park District offers free golf lessons on Monday, Tuesday and Thursday June 9 – June 20 and July 7 – July 18. Lessons are given by Jerry Bowers and are offered to boys and girls ages 7 and up at the driving range at Baker Park Golf Course. The ages are split up into 2 groups: 12 & under and 13 & over. Kewanee Park District also offers a junior golf league held on Wednesday mornings from the middle of June through the end of July. The league is offered to both boys and girls ages 7 and over. Ages 12 & over play 9 holes while ages 7-11 play 4 holes. The fee for non-season ticket holders is $10 per week and for season ticket holders $5 per week. The fee includes greens fees and hot dog, chips & drink after league play for all levels. Is there a method of offering suggestions to help improve the golf course? It is the best I’ve seen it in many, many years and I would love to be able to help keep it that way. There are a couple of ways you can make suggestions. You can put your suggestions down on paper and turn them in to Director Johnson for him to submit to the Board or you can attend one of our Regular Session Board Meetings and present your suggestions to the Board in person. Thank you for the compliment regarding the golf course. We strive to offer the best amenities to our patrons and it’s nice to hear positive feedback. We look forward to hearing your suggestions. Are the junior golf lessons offered for residents only? No, our lessons are open to all junior golfers who would like to attend. A single membership is $325.00 for 61 years old and younger. A membership for those 62 and older is $260.00. You can add your grandson to the membership if you have guardianship over him and he lives with you. Membership for those 14 and under is $140.00. Cart fees are not included in these prices. You can call the office at 309-852-2872 or you can email your tee times and group size to k.parkdistrict@comcast.net. Can I take my dog out golfing with me? We are sorry, but no. Dogs are not allowed on the course.